Somewhere in the forests of India, a mother sloth bear has just given birth to two cuddly cubs. As months go by, the two leave the safety of their den and follow their mom around as she looks for nibbles. Sometimes tired of walking the cubs hop on to mom's back for a joy ride across the forest - they are still young and need her constantly for food and safety. But watching this merry jungle family is another animal who may have left the life of the forest-dweller but retains some of the barbaric ways. He sits prowling and one day kills the mother bear, abducts the young cubs and sells them to those who would bind the carefree pair and turn them into street entertainers for life. This is the sad tale of some of India's sloth bears or black bears that are captured from the forests by poachers and later sold to a community called Kalandars, who elk their living dancing bears. The Indian Sloth Bear (Melursus ursinus) are visibly different from the American Brown Bears and the Black Bears. These bears are also the only species of bear adapted specifically for myrmecophagy (ant and termite-eating). Unlike brown and black bears, sloth bears have lankier builds, long shaggy coats that form a mane around the face, long sickle shaped claws, and a specially adapted lower lip and palate used for sucking insects. Sloth bears occupy a wide range of habitats on the Indian mainland including wet or dry tropical forests, savannas, scrublands, and grasslands but they are primarily a lowland species. It is this reliance on lowland areas that makes them particularly vulnerable to loss of habitat as the areas tend to be the places most readily used by people. It is also here that poachers can easily keep track of bear activities and nab the young ones. 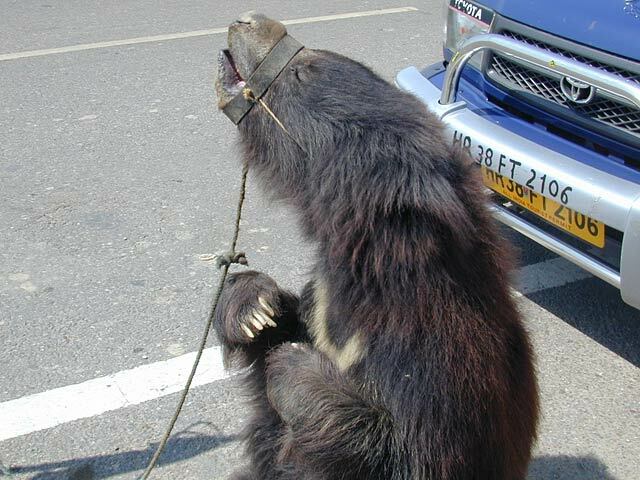 The transformation of a free-willed sloth bear to a bound and tame street performer is a story of torture, coercion and extreme cruelty. Poachers keep a lookout for young 4-6 month old bear cubs and when they find one, they kill the mother and stuff the cub in gunny bags. The cubs are then transported to far off villages in the interiors of northern India, where a community's livelihood depends on these bears. Even as some little ones perish, those who survive the gruesome ordeal face a bleak future. Their trainers knock their teeth with hammers and chop off their claws. A red-hot iron rod is then inserted without anesthesia into their sensitive snouts, through which a rope is passed. The wound is kept raw deliberately and it often bleeds due to infection. Like the bear cubs, the children of Kalandar community too begin their training early on. They never attend schools and are never made to learn any other trade. What they learn from childhood is bear handling and bullying the animal to perform on the streets. But despite the training, the bears can never be actually tamed. The rope that is tied to a circular iron rod passing through the bear's nuzzles, is pulled by the madari-the entertainer. The bear is then forced to stand on its hind paws unlike its natural habit of walking on all fours. So what you believe to be dancing is merely a reflex action, similar to the pull you feel when someone pulls one of your ears! Because the adult bears cannot be taught new tricks again and again, their owners live a nomadic life - Moving from village to village and street to street to make the bear repeat the same moves for a different audience. Ironically, despite all the effort taken to bound and train the bear, the money earned from the business can barely feed the Kalandar's family or his bear. In October, 1998 an amendment in the Prevention of Cruelty to Animals Act (1960) was made that declared bear dancing as illegal in India. But many organisations realised that the root problem to this issue was not the bear hunting, but the inability of the community of bear dancers to learn and adopt any other trade. Thus, with support from the government and other conservation organisations, some NGOs like Wildlife SOS set to educate the Kalandar community and teach them other means of livelihood. In the past decade these efforts have paid off well as presently there are hundreds of the community who have left bear dancing, and are also enrolling their kids to school. They are now earning more through occupations like farming rather than forcing an animal to perform on the streets. There are also many bears that were once street performers but now have been rescued and enjoy their twilight years in specially formed bear rescue and care centres all over the country. Despite the revamped laws and attempts to change the lifestyle of the street performers, few men still prefer the known trade of dancing bears to learning a new trade. They now remain hidden and roam in little known villages where it is not easy to catch them. Poachers also kill adult bears for local use like male reproductive organs used as aphrodisiac; bones, teeth and claws used to ward off evil spirits. Bear fat is also used for native medicine and hair regeneration. They can fetch high prices by selling the bear parts to be used as Chinese medicine. Presently, the International Union for Conservation of Nature (IUCN) has labeled the black bears as a vulnerable species but the threats are constantly increasing. These bears are not only being robbed of their natural habitat, but also live a life exposed to the predator called man willing to separate mothers from their young one in the name of entertainment. If communities don't learn, it might well be a dark black future for the Indian Black Bears.